Equestrian Facilities. [Search All] | Equestrian Zoning 2(+) Acreage. 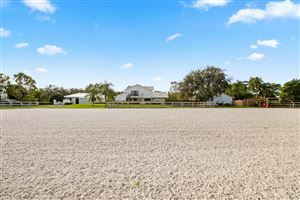 Inviting equestrian property with everything you need to to enjoy the Wellington equestrian lifestyle! Located in the esteemed neighborhood of Paddock Park 2 on just under 2 acres, this farm boasts a 7-stall, commercially built barn (completed in 2016 with fire alarm & sprinkler system) featuring a full bath, tack room with laundry, and a feed room. Additionally, there is an attached 611 sq ft 1 bedroom, 1 bath apartment with a kitchen as well as a studio apartment. There is rubber matting throughout, a fly spray system and security cameras. The 216'x112' all-weather riding arena has full drainage in place with top-tier GGT footing and there are 4 oversized grass paddocks. Price reflects a seasonal rate. Reserve now for 2020 season. Have it all!! 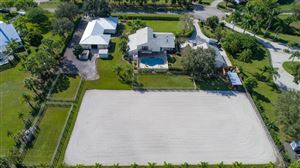 House/Barn/Arena/ Groom room/ pasture turnouts/Gated/ On SW corner of Wellington Bridle Path in Paddock Park 2 in Wellington. Hack to show 30+/- minutes! Private, single family 4 bedroom home, turnkey w/private pool on bridle path overlooking Wanderers Golf course. Hack or golf cart to Showgrounds! Approved pets ok. 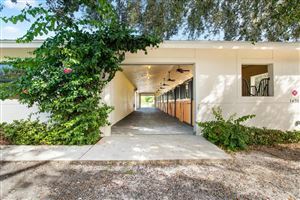 This listing is for house/ 7 stall barn/groom room/arena. Arena (209 x 80). Entire property can be leased at $10,000 mth for off season rental. GREAT EQUESTRIAN PROPERTY on 2.56 acres with 4 large paddocks in the back and 1 in front plus an excellent jumping/dressage riding ring. Nice 6 oversized stalls CBS barn + old barn/storage with 2 running stalls. Has been approved for quarantine by USDA Beautiful house with 5bed/2 bathrooms with exquisite natural coralstone fireplace.No pets nor smoking . Beautiful 6BR/3BA equestrian ''French cottage'' style home on one of the largest 2.35 acres lots in area complete with ''mother-in-law'' apartment. Private and screened heated pool with covered patio , great for entertaining! Completely redeveloped property with convenient private access to bridle path to hack to international showgrounds. Great riding ring with Martin Collins ''all weather'' footing, new. CBS 6 stall barn with new luxury stalls + old barn/storage with 2 running stalls. All irrigated. Fantastic 4 bedroom 3 1/2 bath home with office. Heated pool, screened patio with summer kitchen and grill. Available for off season rental until November. Property is also for sale. Stalls are for rent at 2,000 $ per month per stall without service.Use of the ring is included. Developed by Smith | SG Raptor Series | Coastal Luxury Properties | Engel & Völkers - Copyright © 2016 All rights Reserved.